Hello ! So it's Wednesday and I'm on my class trip. I probably have an amazing time. I can't rally write a lot here, because I'm preparing this article on Sunday ha ha. Our lovely blogspot lets us to plan articles. I'm going back to my city at Friday night so next article also will be planned ha ha. I promise that when I will have my computer back, I will write you all and more about this wild adventures. Stay updated ! Pastels are well known and very popular colours always. Light and soft shades of pink, blue, yellow … As every girl I love them so much and decided to compare with Sporty outfit. Black jeans = black classic which almost every girl has in her closet and crop top ( not completely ), striped one is really nice I think which also is a comparison of gray and white. Patel pink on the sweatshirt ! I don't usually wear this kind of clothing, but it was a cozy day so I dressed up in it and added my lovely babies, black Air Max Thea which are as soft as cushions. Love them ! Here we can also find a massive game of details. Watch in silver with snake's skin on the bracelet ( don't worry I'm not a kind of person who buys a real animals skin) as an addition I chose a charm bracelet with a lot of small essentials and symbols. 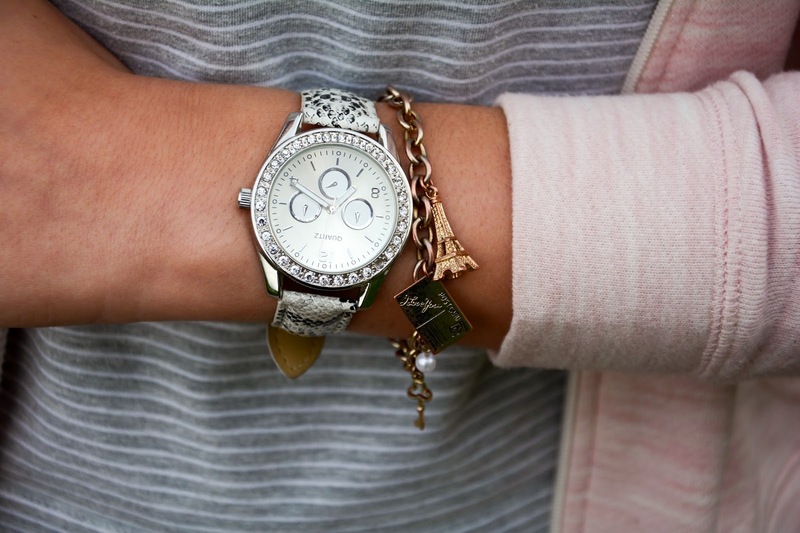 Traveling all around the world written on one bracelet and also earring with pinky crystals. I love all this stylization ! Lips are lightly underlined with Yves Saint Laurent lipstick. I have also a big bag in pastel pink. I really love this look. Have a fabulous day loves !